A new network of European NGOs aims to reduce immigration detention by showing governments what works better in practice: not just by talking about it, but by actually doing it. Set up at the end of March, the “European Alternatives to Detention (ATD) Network” links civil society organisations developing case management-based pilot projects in five European countries. Each adapted to their own national context, these projects have one thing in common: they aim to demonstrate that detention is not necessary when migrants are supported and treated as human beings in the community. They are about showing, through practice, the kind of alternatives that can build migration governance systems which don’t rely on detention. “In Cyprus, we’ll be providing working examples of case management in the community as a way to advocate for the implementation of effective alternatives” explains network member Corina Drousitou of Future Worlds Centre, “this includes legal advice, social counselling, mediation with authorities, referrals to other organisations or services to cover their basic needs”. The problems with immigration detention are well known: it is extremely harmful, very expensive and also largely ineffective: detention actually reduces people’s motivation and ability to cooperate with immigration procedures. There is also ample evidence that detention is not necessary: with support and engagement migrants can resolve their cases in the community. 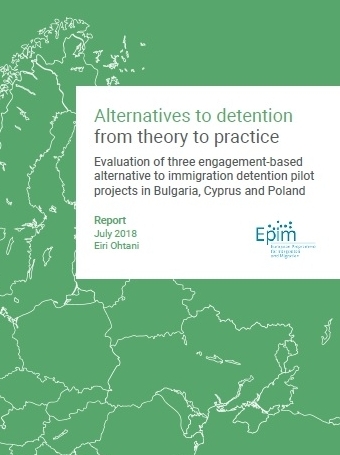 Engagement-based alternatives are highly effective, better respects rights and are much cheaper than detention – they provide the way to ensure detention is really used only as a last resort. But few governments in Europe have developed effective alternatives, despite the obligation to pursue less coercive measures before applying detention. Now, with the increasing reliance on immigration detention in the region, the need for solution-based advocacy is stronger than ever. “Talking about effective alternatives hasn’t been enough in Europe. That’s why we’re moving to the next level of solution-based advocacy: actually showing through the pilot projects in the network that this works” said Jem Stevens, IDC’s Europe Regional Coordinator. In Europe, discussions of ATD have focused on lists of restrictions or conditions placed on individuals (reporting, designated residence, bail etc). These often run parallel to detention and seek to control migrants through varying levels of coercion. But there is little evidence that they are effective in increasing compliance or case resolution. There is therefore a need to shift the focus to look at alternatives that actually work. Engagement-based alternatives involve a very different approach. Instead of mistrusting and trying to police migrants, they use social work methodologies: providing tailored case management to support and empower migrants to explore all migration outcomes. They work because, as IDC’s research shows, people are more likely to stay engaged and comply with immigration requirements, including negative decisions on their status, when they feel they have been through a fair process and can meet their basis welfare needs. “It’s achievable and doable to support people in the community instead of detention” said Tony McMahon, Detention Action’s Community Support Officer. Since 2014, he has been working with young migrant ex-offenders at risk of indefinite detention in the UK. “I see my job as helping clients to make the best decisions they can make, helping them to live in the community”, he explained. The project has achieved at least 90% compliance rate and is estimated to save between 83% and 95% of the costs of detention. What will the network aim to do? 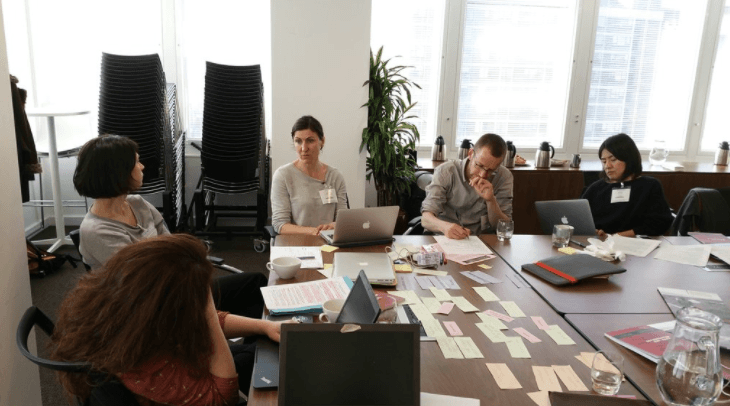 The network brings together NGOs in the UK, Cyprus, Bulgaria, Poland and Belgium – each running or exploring pilot alternatives – with the IDC and PICUM, which will lead on advocacy at the EU-level. Through the network, members will support each other’s work and collectively build a knowledge and evidence base on how effective case management-based alternatives work in practice. The aim is to help and encourage NGOs, governments and the EU to start developing alternatives that can build systems which don’t assume a need to detain. EPIM is funding a number of ATD pilot projects within the network. 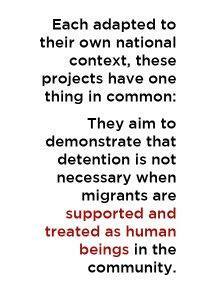 Network member Detentions Action’s report, Without Detention, highlights the opportunities for community-based alternatives to reduce the detention of migrants in the UK. Network member, Future Worlds Center, details their pilot alternative to detention project here. This article first appeared in the International Detention Monitor (April 2017) and was revised on 27 April 2017.